It is very agreeable to sit under the awning on the terrace of the Hotel Continental, an electric fan just above your head, and with an innocent drink before you to read in the local paper heated controversies upon the affairs of the Colony and the faits divers of the neighborhood. 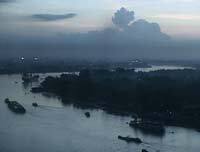 The Saigon River has always been a thriving trade route. Saigon is not an ancient city. Around the same time the first British colonies were being established on the East Coast of what would be the United States, a village originally called Gia Dinh was founded on the banks of the Saigon River. In the 18th century, Gia Dinh became known throughout the region as a trading center where Chinese, Malay, Dutch and Portuguese ships stopped off for Vietnamese silks and other goods. In 1790, the founder of the Nguyen Dynasty which ruled Vietnam into the 20th century built a defensive citadel in what is now downtown Saigon, not far from where Chinese immigrants had set up shop in an area that would be known as Cholon (Big Market). But it wasnt until French colonists declared Saigon the capital of their protectorate of Cochinchina in 1861 that the city really began to flourish and expand. In the 1850s, persecution of French missionaries gave France an excuse to expand their colonial empire into Vietnam. In 1859, French troops destroyed the citadel at Gia Dinh. Skirmishes continued until 1861, and the population of the city that was coming to be known as Saigon fell from 40,000 to just 8,000 as residents fled the fighting. After France forced the Nguyen emperor to sign over control of Vietnam, the colonialists embarked on an ambitious building spree in Saigon, using Vietnamese slave and convict labor to fill canals, pave wide boulevards, build elegant government and residential buildings, even erect a European-style cathedral. French soldiers, businessmen, officials and their wives shopped for the latest Parisian fashions at boutiques along Rue Catinat, gathered for cocktails at the Cercle Sportif, read week-old editions of Le Monde on the verandah of the Continental Hoteland insulated themselves as much as possible from the poverty of the rest of the citys 100,000 inhabitants. Many Vietnamese, especially the well-educated sons of native civil servants, chafed under the restrictions, taxation and lack of liberty the French had imposed. As the Governor of Cochinchina wrote in 1902, The development of big centers such as Saigon and Cholon has given birth to a kind of urban and suburban proletariat whose attitude and activities cause serious and legitimate concern to the European population. The Indochinese Communist Party (ICP), founded in 1930 by Ho Chi Minh and others who saw Marxism as the only hope for salvation, began to plot the end of colonialism in Vietnam. Saigon was increasingly the scene civil unrest as Communist labor unions protested French exploitation of workers. When France was conquered by Nazi Germany in 1940, the citizens of Saigon suddenly found themselves answering to new masters. Japan took over governing Indochina for the duration of WWII, throwing French troops into jail and garrisoning thousands of soldiers in converted schools and other buildings in Saigon. Any hopes that the Japanese would be more sympathetic occupiers were quickly dashed, as the troops terrorized and looted the countryside. By 1941 the people of Vietnam suffered from famine thanks to their new masters, who hoarded rice for export to Japan. In March 1945, the Japanese forced the last Nguyen emperor, Bao Dai to declare the independence of northern Vietnam from France. But when the Allies defeated Japan in August of 1945, revolutionary cells of the communist party known as the Viet Minh was quick to step in and take advantage of the uncertainty that followed. On September 2, using language borrowed from the American Declaration of Independence, Ho Chi Minh announced the formation of the Democratic Republic of Vietnam. Ho Chi Minh, North Vietnam's leader, spent only a few days in the city that now bears his name. Born in central Vietnam in 1890, he left his country while in his early twenties and traveled everywhere from Hong Kong to Russia to Africa to New Yorkwashing dishes at a Boston hotel, toiling as a photo retoucher in Paris by day and meeting leading Communist agitators by night. Anguished missives sent to Western leaders show Ho Chi Minh trying to convince the U.S. to support a free and democratic Vietnam, but to no avail. Only the Soviet Union offered assistance. Ho Chi Minh returned to Vietnam for good in 1941, establishing guerrilla bases in the mountains. After declaring independence in 1945, he would spend the next twenty years leading the Communist north through twenty years of war. His ruthless determinism shocked the West, and his statement to the French in the 1940s that You can kill ten of my men for every one I kill of yours, but even at those odds you will lose and I will win, proved eerily prescient. Ho Chi Minh died in 1969, before he could see his dreams of a unified Vietnam come true. But Uncle Ho, as hes known, remains an enigmatic figure in Vietnam today. Officially revered almost as a saint, his Hanoi mausoleum (built against his express wishes) remains a pilgrimage site for Vietnamesesome of whom spend days walking in from the countryside to pay their respects.